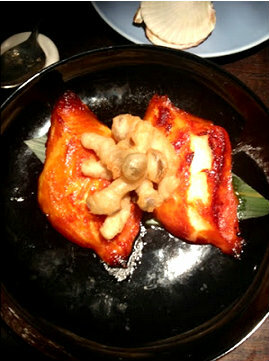 Recently one of my lovely friends very kindly took me out for an incredible lunch at the world famous Hakkasan. I'd previously heard great things about Hakkasan for their amazing food and inventive cocktails so was excited to give it a whirl. We visited the Hanway Place branch just off Tottenham Court Road only identifiable by these huge black and gold detailed doors. To start we had a mixture of prawn, beef, scallop and asparagus (not shown) dim sum. 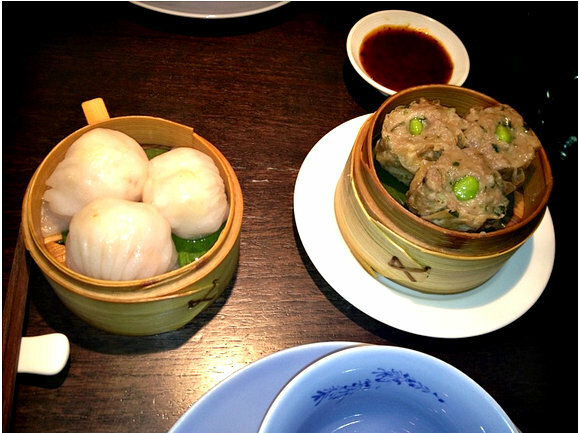 Oddly, I'd never tried dim sum before so I was really intrigued by these gooey filled parcels. I wasn't a huge fan of the prawn variety but loved the beef and scallop with asparagus. 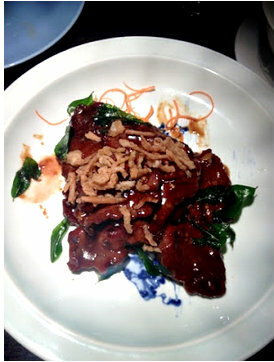 We also tried the stir-fry ostrich in yellow bean sauce. I'd never tried ostrich before so had no idea what to expect but it was very tender and had quite an interesting taste. I probably wouldn't order ostrich again in any hurry but that's purely because it didn't blow me away. 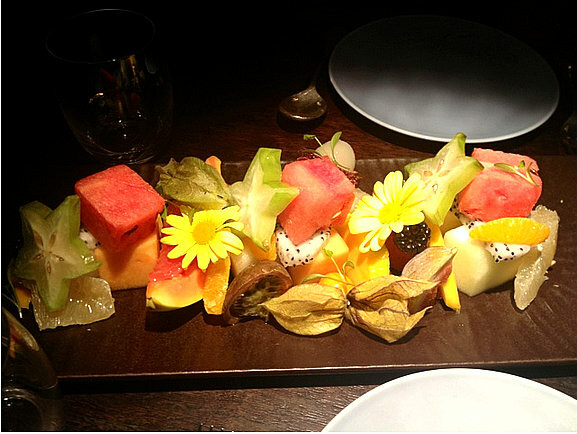 This is one of the prettiest dishes I've ever seen- a real mixture of delicious tropical fruit and beautiful flowers. I couldn't get enough. 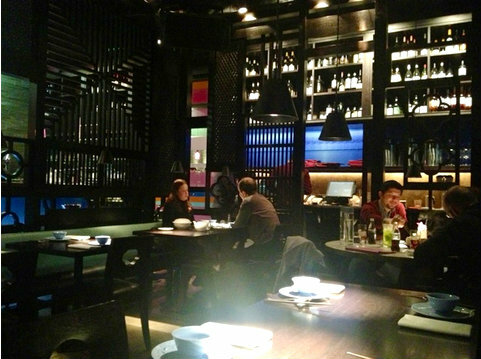 I was so impressed with Hakkasan, the food was incredible in both taste and presentation and the attentive waiters meant we never had to fill up our green tea or water once. As I was feeling a little under the weather I didn't get to try any of their famous cocktails but that's definitely something on my to-do list as I've heard they're great. 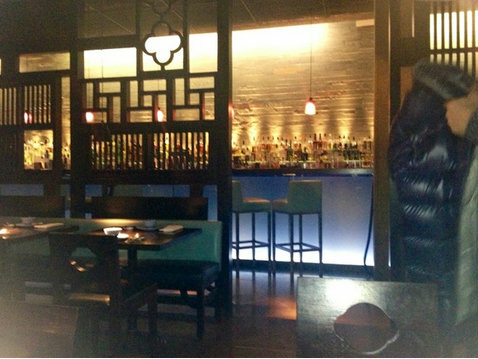 If you're looking for a restaurant for a special occasion this definitely fits the bill. 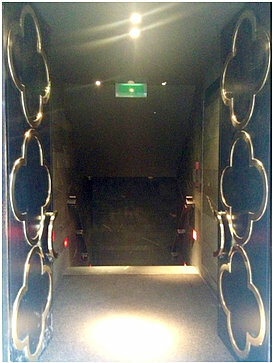 Even their toilets were impressive with harry potter-esk huge gold taps and doors disguised as walls. Well done on your restaurant choice, J.